Home / Blog / Announcements / Make the Matches 🙌 Announcing Two Matching Challenges! This is a time-sensitive announcement. The 2018 Giving Season launches on November 27 with two matching challenges. 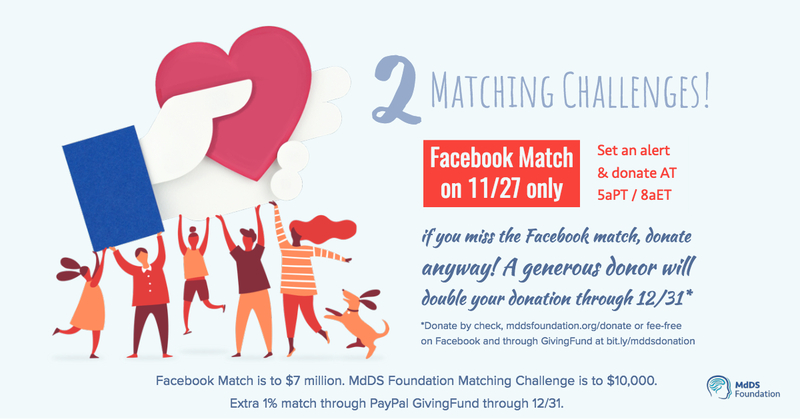 Starting at 5am PST/8am EST donations to nonprofits on Facebook, like the MdDS Foundation, will be matched until $7 million in Facebook matching funds are dispersed. Just donate through our special Matching Challenges fundraiser page or any donate button on our Page. With over 1 million nonprofits on Facebook vying for the funds, last year’s GivingTuesday match was met in under 30 minutes. Please add this event to your calendar and set an alert. This one’s not limited to Facebook, and it runs through year-end! A generous MdDS Foundation supporter is matching donations no matter how they are made. Let your friends and family know they can support you by donating in their favorite way — to your personal fundraiser, mddsfoundation.org/donate, or check — and help us make the $10,000 Matching Challenge. To those of you gathering together on Thursday, we hope you have a wonderful Thanksgiving surrounded by friends and family. If you are shopping deals on Black Friday and Cyber Monday, we hope you stay out of the fray and have a stress-reducing tip for you: Start with a Smile. When you shop through Amazon’s charity portal, smile.amazon.com, they make donations to the Foundation. We hope you’ll set aside some of the money you save for the matching challenges. Thank you for supporting MdDS research and awareness efforts, and helping MdDS warriors get their lives back. This Giving Tuesday, PayPal is offering a 100% match on donations received through its holiday campaign (up to $500,000 in total matching funds), followed by a 1% donation match through to the end of the year. Give through the PayPal app or through our charity’s unique link: paypal.com/us/fundraiser/charity/23117 This one starts at 5:01 AM PT on 11/27.